Two masked men armed with machetes threatened staff during a robbery in the borough. At around 9.30pm on Friday 16 March, police were called to reports of an armed robbery at the One Stop Shop on Church Lane in Lowton. They approached a member of staff at the back of the store next to the tills. One of the men placed a quantity of cash into a bag that the men had brought with them. A second member of staff was then forced towards another till before one of the men climbed over the counter and used a machete to prise it open. The duo stole more cash from this till in addition to tobacco and two bottles of vodka before the pair fled in the direction of Fullwood Road. The offenders were wearing black clothing, with balaclavas and gloves and both men carried machetes. 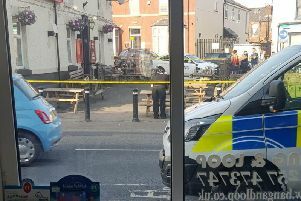 Detective Constable Chris Waddicar of GMP’s Wigan borough said: “No one should be in fear for their life while at their place of work and this is an incident which could have had really terrible consequences. “These two men armed themselves with weapons to inflict fear and this in itself is appalling. Anyone with information should call police on 0161 856 7292, quoting incident number 2112 of the 16/03/18, or the independent charity Crimestoppers, anonymously, on 0800 555 111.